My interest during the residency was to draw upon the potential of contemporary botanical science to create images that lie somewhere between science and symbolism. ‘Archetypes’ are explorations in plant morphology, inspired by J. W. Goethe’s search for the archetypal plant or the ‘Urpflanze’. The ‘Urpflanze’ described ‘one basic form that manifests in the multitude of single plant individuals; and within this basic form, there lies the potential for endless transformation, by which manifoldness is created out of oneness.” These ideas were developed and enlarged upon by plant morphologist Agnes Arber, who argued that a classification based on similarities of form could be more instructive than one based on evolutionary relationships. I was fortunate to be able to work with Prof. Mohan Ram and Dr. Rajesh Tandon at the Dept of Botany in Delhi University. Conversations with them led me to compare plant structural similarities at a macro and microscopic level. With their collaboration, I was able to use complex images of plant surface features as viewed under a scanned electron microscope, including hair like trichomes, highly ornamental pollen structure; and stomata with mouth like apertures. 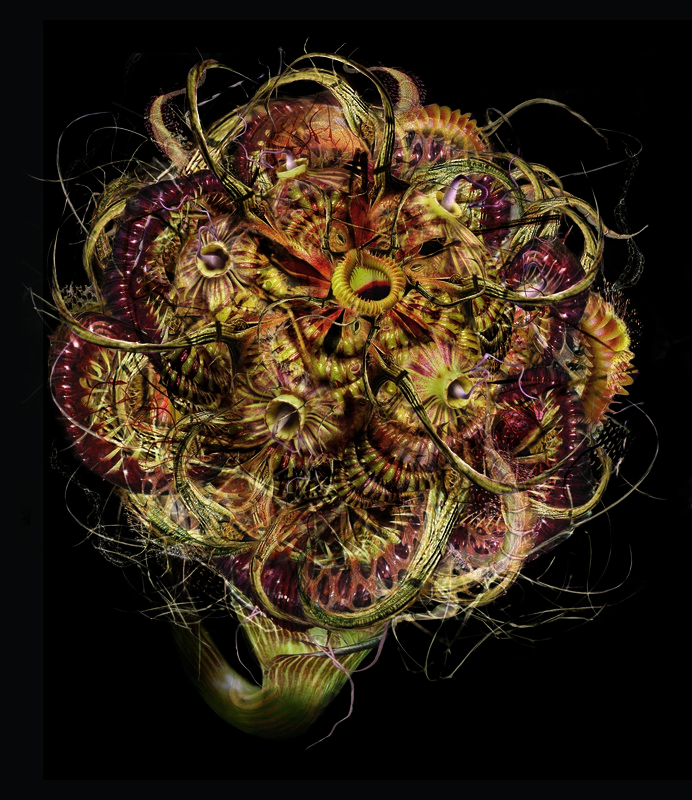 These images were then restructured with photographs of parts of diverse plant species to create hybrid organics that float in a twilight world halfway between imagined and observed reality, strange denizens of a science fiction botanical garden. In the scientific realm, as the rate of genetic modification accelerates, and plants are modified with plant, animal and human genes, the boundary of form and function blurs and these strange hybrid organics become more of a possibility of what could be.